2. 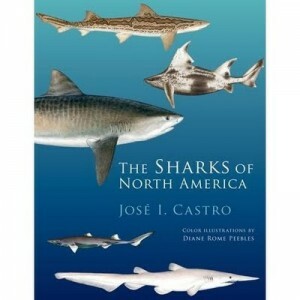 The Sharks of North America (by Jose Castro). This highly anticipated follow-up to Dr. Castro’s 1983 volume summarizes the known science, taxonomy, and conservation of each of the 135 known species of sharks that occur within 500 nautical miles of North America. The 600+ page volume is an incredibly detailed guidebook and reference, and also contains over 100 beautiful color illustrations by Diane Rome Peebles. Another interesting feature of this book is the etymologies of certain species names- I, for one, have often wondered why a certain species gets a certain name. Though this isn’t included in the book, the story of one species name in particular (Oakley’s Catshark) really interested me. It was named for Doug Oakley, a field assistant with the South Carolina Department of Natural Resources shark survey who died of a heart attack during a scientific research cruise. Several years (and several other field assistants) later, the SCDNR shark survey hired me to do what was Doug’s old job. As Chuck pointed out in his review, this book doesn’t address very recent discoveries, and the book’s preface acknowledges that it is current only to 2008. Also, the book is written in a very technical style that may not appeal to non-scientists. Still, I wholeheartedly agree with my hero Eugenie Clark, who wrote in the foreword “I predict that there will never be another book on sharks as informative and beautiful as this one”. $90, Oxford Press. 3. 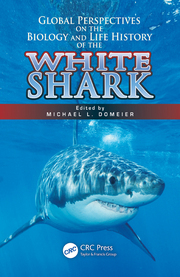 Global Perspectives on the Biology and Life History of the White Shark (edited by Michael Domeier). Though based on the 2010 International White Shark Symposium, this book isn’t quite a “conference proceedings” because it also includes contributions from numerous leading great white shark researchers who weren’t able to attend the meeting, but the style is very similar to a conference proceedings. 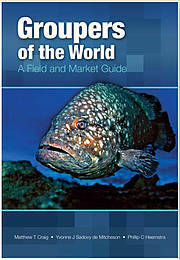 Each chapter is written by a different group of scientists and represents original peer-reviewed research. An enormous variety of research is covered, including physiology, behavioral ecology, diet, toxicology, migratory patterns, hunting behavior, historical fisheries, and policy implications. Some of the discoveries discussed in this volume (and at the Symposium) represent a drastic change in how scientists think about great whites- for example, recent satellite tagging has shown that they are primarily an open-ocean species and engage in huge migrations. As great whites are one of the best known, best studied, and best protected species of sharks, I’m pleased to see such an excellent volume focusing exclusively on them. Disclaimer- some of the chapters are co-written by my adviser. $99.95, CRC Press. 4. 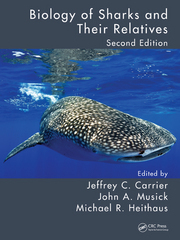 Biology of Sharks and Their Relatives, second edition (by Jeff Carrier, Jack Musick, and Mike Heithaus). The new-and-improved second edition of this excellent series contains the latest information about many aspects of shark research. Additionally, the book contains several brand-new chapters focusing on how improved technology (molecular/genetic methods as well as satellite and acoustic tracking) has affected shark research. As with the first edition, this volume primarily focuses on 3 broad sections of elasmobranch research: phylogeny and zoogeography; form, function, and physiology; and ecology and life history. Within each section, there are several chapters focusing on a specific field of research, each written by a team of experts in that field. While the language of some chapters may be a bit technical for some non-scientist readers, this book (and the others in the series) are an invaluable guide to shark science. This book is worth getting for the epic reference list alone. $99.95, CRC Press. I’ve included a link to each book for anyone interested in purchasing it online. For those of you attending the conference, CRC press (Groupers of the World, Biology of Sharks and Their Relatives, Biology and Life History of the White Shark) will have a booth in the exhibitor’s hall. The Sharks of North America will be for sale at the American Elasmobranch Society store.